You already know how to search. You've grown up searching Google, your phone, and all over the place, and you generally find the stuff you need. Doing scholarly research, however, involves more than just knowing how to search. In fact, a lot of what you know about searching may actually get in the way when it comes to doing research in library catalogs, article databases and other scholarly tools. This short guide will help you get started with research at Cal. New to the libraries at Berkeley? Check out our Library 101 video to learn more about study spaces, get help with your research, and to find places to experiment with technology! Google Books and Scholar are great tools (keep using them! ), but a lot of scholarly material is stuck behind paywalls. You might find a link via Google, but can't always access the full-text for paywalled resources. The Library pays subscriptions to hundreds of databases and publications so that you can access those scholarly eBooks and journal articles that aren't freely available to the public. Using your CalNet credentials, you can access those materials via the Library website. When it comes to scholarly publications, only the tip of the iceberg is going to be accessible on Google. Use Start Your Search on the Library homepage. This provides one search box where you can look across a lot of online databases, including the library catalog. But keep in mind that it does not include everything we subscribe to, so if you rely on Start Your Search you'll be missing out on a lot! Search OskiCat for books and other materials on the shelves of the UC Berkeley Libraries. OskiCat also includes eBooks and links to online journals, but it doesn't include articles from those journals. How to Find Articles explains how you can dig deeper than Start Your Search or OskiCat, by using subscription databases to find articles from scholarly journals. We subscribe to hundreds of different databases! Slow down: Good research takes time, and learning new things is not a matter of instant gratification. Take the extra time to explore your advanced search options, to scan search results, and to search iteratively for variations on your topic (that is to say, search over and over!). Browse: Scanning shelves of books may sound like a waste of time, but when you're first starting your research it's actually a great way to find the perfect source. To browse books effectively, first search OskiCat for the call numbers for a few books that are relevant to your topic. Right next to those books on the shelf, you'll find tons of other books on the same topic, often better than the one you found online. Use jargon: Are your keywords not working? Then try the vocabulary that a scholar might use to talk about the topic. If you're interested in what opportunities there are for women in Morocco to learn to read, for example, you might use keywords like Gender, literacy and empowerment in Morocco. Here's a keyword brainstorming tool [PDF] that might help. Anxiety is normal: Carol Kuhlthau and other information experts have noted that the early stages of research are often accompanied by uncertainty, worry, and doubt. As you progress through your research and learn more about your topic, however, you are likely to experience increased optimism, clarity and even confidence. So don't let those initial worries get you down: they're a natural part of the process. How to Find Books - Learn more about using OskiCat and Melvyl to find books and other items in the libraries. Google Research: Tips, Tricks and Hacks - Learn to use Google for research purposes. How to Read Call Numbers - Call numbers are like the address that a book lives at on the shelves. Take a look at this guide to learn how they work. How to Read Citations - Learn to distinguish one kind of citation from another (e.g., a book from a journal article), and identify the elements you'll need to use to find the material. Subject Guides - Follow these expert guides to find resources in specific disciplines. Finding Historical Primary Sources - Learn how to dig up sources in the archives, including diaries, memoirs, letters, and more. Evaluating Resources - Once you find a resource, how do you assess its value and relevance to your research project? 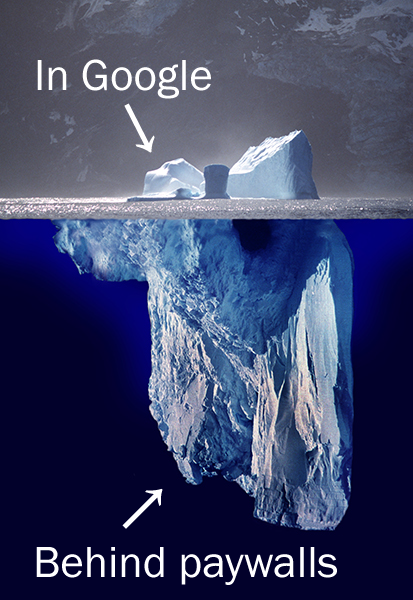 Image credit: Photo montage of iceberg from Wikimedia Commons.